Time for waiting is over now! Waiting game is over for Karachi! This week had been a little quiet in terms of monsoon showers as no weather system has approached any part of the country, most weather system are dieing before entering Pakistan except for monsoon moisture which has been interacting with western troughs to enhance monsoon activity. Temperatures had increased in the country as forecasted by PWP. High humidity has also rised. Overall these are some things that have been observed during this week. Whats ahead? 43 °C to 45 °C in Sukkur. 39 °C to 44 °C also in Larkana. 43 °C to 44 °C in Nawabshah. 38 °C to 40 °C in Hyderabad. 42 °C to 45 °C in Lahore. 38 °C to 40 °C in Islamabad. 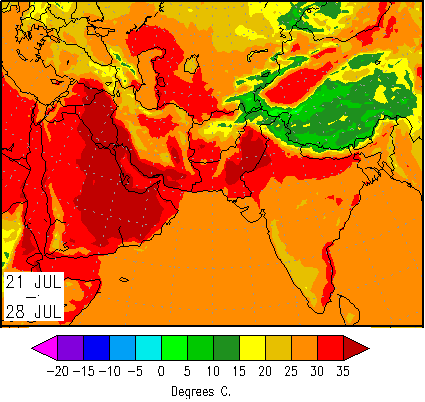 40 °C to 44°C in Multan. 40 °C to 44°C in Faisalabad. 38 °C to 40 °C in Peshawar. People of upper Sindh and southern Punjab should take precautions till 2 to 3 days and avoid unnecessary outdoor activities, as on July 20, at least 4 people were killed in Jamshoro, Sindh due to intense heat waves. The death toll has now reached 40 in Pakistan, all these deaths were weather-related from heat wave to rainstorms to floods since June 25. Much awaited rains are here!! Pakistan to be covered with monsoon! The soul of monsoon is unusually very quiet that is Bay of Bengal. The Bay usually produces low pressures or depressions that enhance monsoon activity but so far it is failed to do so. 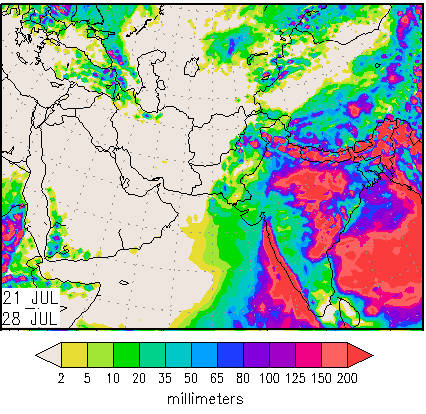 While the Arabian sea is doing all it could to keep monsoon alive, strong cross-equatorial flows over Arabian sea that along with trough from Maharashtra coast to Kerala coast, is bring heavy to very heavy rainfall to this part of India. But others are not so lucky. Monsoon had covered Punjab, Khyber, Kashmir, North-eastern Balochistan and upper Sindh except for south-eastern and coastal Sindh, which are desperately waiting and are thirsty for first drop of rain. But as they that Patience is bitter, but its fruit is sweet, maybe that is true! So Karachiites, it seems as if your waiting game is finally over as monsoon rainfall is expected. Note: This is the forecast of Pakistan Weather Portal (PWP), we are 75% confident with this prediction. There will be slight variations in our forecast as certain meteorological factors develop and fade as time passes by and these factors are too isolated to be noticed on models, so if any change arises then PWP will update you. 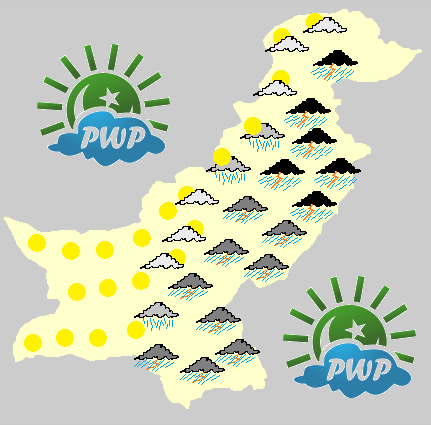 Now PWP upgrades that forecast to “very high”, at least 48 hours have passed but that forecast has not changed and we are confident that monsoon will cover while monsoon regions of Pakistan on July 24 mid-day. On July 23, PWP upgraded its monsoon forecast for Karachi from “very high” to “extremely high”, we are confident that monsoon will hit south-eastern Sindh and Karachi in 36 to 48 hours. Fresh monsoon rainfalls are likely in almost all parts of monsoon belt of Pakistan during late this month that is from July 23 night. The monsoon belt of Pakistan include Islamabad, Punjab, eastern Khyber, north-eastern Balochistan, Kashmir and Sindh including Karachi other regions that is rest of Balochistan, FATA, rest of Khyber and Giglit are non-monsoon regions. As of 5:30 pm PST July 21, various models are indicating that the upper air cyclonic circulations over the Bay of Bengal that would cross West Bengal province and gain intensity into a low pressure area (happened as of July 21). 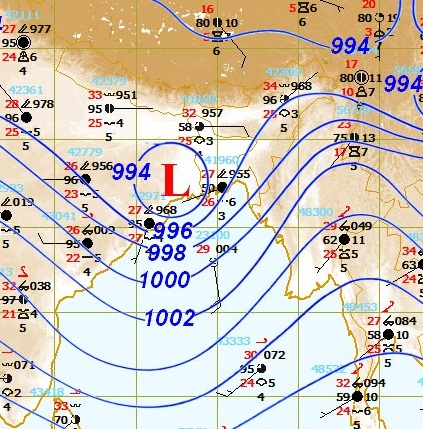 The system would approach Madya Pradesh where it may lose intensity and become a UAC from here it will start its journey to south-eastern Sindh, while moving it will lose its intensity but it will send strong monsoon moisture to upper parts of Pakistan with strong currents from Arabian sea. The UAC will approach Sindh by July 24/25 by that time the system will be highly sheared and it will tear into different parts of thunderstorms and eventually dissipating over the Arabian sea. Few of its thunderstorms will also reach as far as Oman. The 4th spell of monsoon will begin from July 23 night and continue till 3 to 4 days, till July 27 mid-day. Rain will be accompanied by fast to strong winds and thunder, it will be moderate in intensity with isolated heavy falls to isolated very heavy falls. In Northern Punjab: Lahore, Faisalabad, Murree, Rawalpindi, Sargodha, Sialkot and other adjoining cities. The 4th spell will begin from July 23 night and will continue till July 27 mid-day, and decrease thereafter . Rain will be accompanied by fast to strong winds and thunder, it will be moderate in intensity with isolated heavy falls to isolated very heavy falls. In Southern Punjab: Bahawalpur, Multan, Rahim Yar Khan, D. G. Khan and other adjoining cities. The 4th spell will start from July 24 night and continue till July 25 night, and decrease thereafter. Rain will be accompanied by winds and thunder, it will be moderate in intensity with moderate falls likely. In Upper Sindh: Sukkur, Larkana, Jacobabad, Kashmore and other adjoining cities. The 3rd spell will begin from July 24 mid-day an continue till July 25 night, and decrease thereafter. Rain will be accompanied by fast winds and thunder, it will be moderate in intensity with few isolated heavy falls, but mostly scattered moderate falls likely here too. In South-eastern Sindh: Mirpur khas, Umerkot, Tharparkar, Badin and Hyderabad. The 1st monsoon spell will begin from July 24 mid-day and continue till July 25 late night, and decrease thereafter. Rain will be accompanied by gusty winds and thunder, it will be moderate in intensity with isolated heavy falls. In coastal Sindh: Karachi, Thatta, Keti, Shah Bandar and other coastal localities. The 1st monsoon spell will begin from July 24 mid-day and continue till July 25 late night, and decrease thereafter. Rain will be accompanied by fast winds and thunder, it will be moderate in intensity with isolated heavy falls, but mostly scattered moderate falls likely here as well. Overall monsoon will cover all the monsoon regions of Pakistan and it is very likely that monsoon regions of Pakistan will be covered completely by monsoon on July 24 mid-day. ← United Nations declare southern Somalia a “famine-hit region”! @sam where do u live…? dear Babar Bhai, i would Like to thanks on the behalf of all Karachites for such an accurate Prediction of Rains in Karachi.as after a long arguement between your viewers and you,we finally had rains no matter whatever their amount was But still i am glad to appreciate you and Your Weather Portal for such a hard work.Despite the fact of No rains in karachi you faced many thorns as a compliment from your viewers…..
phase 8 no rain here 😥 i have been waiting for sooooo long and my area doesn’t get any rain……. barish khatam or sky is clear,thori si barish hui hai,abhi or barish ho sakti hai kiya? n0w the weather is calm and the cl0uds are still hovering over Karachi, Humidity is waaAaaaayyyy Too much high. n0w i’m getting sweaty again bc0z of this humidity. chance of rain tonight as well..! Today’s forecast of BBC came out to be true as they forecasted Thundery sh0wer today. Baber bhai any new update about rain…? KARACHI METRO when will u update the monsoon of pakistan page? Short but very havey rain in Bin Qasim area. I enjoyed todays winner in rain advisory is TARIM good job man. will it rain tonight…………!!!!!!!!!!!!!!!!! karachi metro!!!! Hamarey area mein bhi bilkul rain nhi hui bufferzone me! Where do you live BEEBA? maza nahi aya halki si barish hui bas,badal to aisai thai kai lag raha tha buhut zayada barish ho gi laikin badal ai or guzar gai halki si barish barsa kat. 245 FDR tripped and restore all of them. Zulfi you are right but very heavy rain in Port Qasim Bridge area if you visit the steel mill entrence from port side. extreemly heavy rain… waoooo. only for 45 min. how can we share pic of rain or cloud is it possiable..? can anyone share the pics of todays rain? check out clouds are over cost of Balochistan. plz can anybudy tel about rains in khi? No idea . but as per wind direction they are not coming towards us…. @ Sam blog update is very slow reason is KESC faults in areas and no lights…. I am 100% sure whole Karachi is all clear of clouds. rain chances are 0% for atleast next 6 hours..
any other evidance of lightning ….? wind pick up now 18 km/hr. the difference of ambt temp and Dew point is only 4 C , i heared if they are close may it raining… not sure..
zohair bhai where u saw the predictionn of pak met? @ Sam…..wind blowing WNW….20KM/hr now. humidity 80% means? greater humidity is good for rains? guys any idea what happen to KM…. is he okay…! No i dont think so some thing else could be… i did not see his comments since noon. yaar what do u people say about rain tonight or tomorrow? Hope he will be fine …… Where is Tarim and others….? This system was going towards Balochistan and it was very near Karachi so it might’ve caused a thunderstorm to pop-up over Karachi, thats why rain was of 0w intensity. Sorry i meant LOW* intensity. Looks no chance of rain till 2marow. A huge cloud over cost of Balochistan. Their are slim chances that lightning over extreem North of Karachi. are you sure NE i think NW..
Wind Dir now again West and speed drop to 8km/hr. RH 80%. few clouds are passing south east of Karachi…. he also says “i am very accurate”, clouds come from east and so on,….. Chances of rain in afternoon…. any update for rain ? Heavy rain ho to bufferzone me zarur ho INSHALLAH! @EVERY BODY – Monsoon 2011 is weaker than 2008 as of now. Dust storm and heavy rainfall lashed Karachi on July 28, 2008, rain was 56 mm. Is the 1st spell over ??? Will La-Nina return in august ?? It seems over, drizzle/light showers could occur in next 24 hours.. I have not checked the La-Nina conditions since the last article of La-nina.. If La-Nina returns with a +phenomenon then will the post monsoon be very wet for Karachi ?